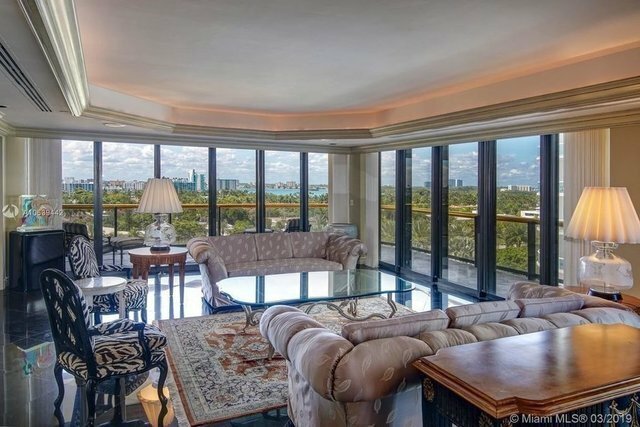 Private elevator foyer welcomes you to this elegant residence with spacious wraparound terraces & mesmerizing views of the ocean, Biscayne Bay & city skyline. Apartment features two bedrooms & three full baths, powder room & a conveniently separated staff quarter. Opulent formal dining & living rooms flow into gorgeous study room equipped with custom built- ins & attention grabbing high end mill -work: crown moldings, columns, tray ceilings & more. Beautiful black granite floors complete the space. Master suite features marble adorned bath with sitting area, spacious walk in closet & sumptuous bedroom with a deep terrace perfectly set up to admire picturesque sunsets. Premier beachfront building offers a renowned restaurant & top notch services. Dining room chandelier is excluded.